Mix half a bottle of red wine with juice from a lemon and an orange, ¾ cup of sugar, vanilla extract, a cinnamon stick and cloves. 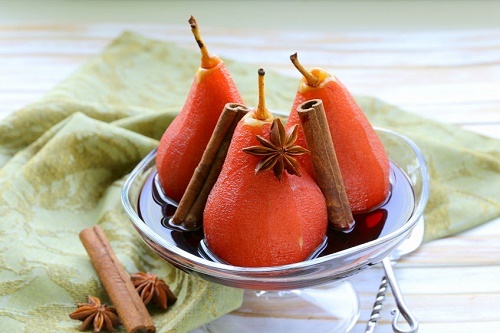 Bring it to a boil and add in 4 ripe whole pears. Let the mix simmer. You can serve the pears after letting them soak in the mixture for 20 minutes.